Or What Are My Chances of Rolling Three Successes? We all love buckets of dice. 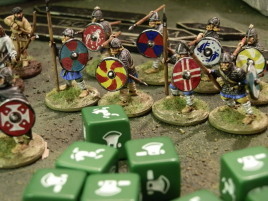 They have a nice tactile feel, rolling loads of dice for an attack really gives the impression of power and generally it's easy to pick out the successes to determine the outcome. Gamers just love dice, and so do game designers. But what are your odds, really? Let's find out. Let's get some definitions out of the way first. We're talking about multiple identical tests rolled at the same time. Those tests may be sequential like the well known hit-wound-save -cycle, but each test could be rolled in isolation, they do not directly affect each other. Working out the probability of success for a single test is pretty basic probability math and should be no problem for anyone who wasn't completely comatose during high school math class. You can even resort to counting the die faces in a pinch and still arrive at the correct result. Even working out the expected number of successes is easy, all it takes is some simple multiplication. You'd expect to get five tails on ten coin flips. Sometimes this knowledge is enough and the more dice you are rolling, the more likely the result is to be close to the expected value. But what if you really need to take all of those orcs out right now? Or what if you're using one of those new-fangled modern rule system where the dice rolls are individual but final result is determined by the total amount of successes rolled? What are your odds for rolling three or more successes? The problem, ofcourse, is that there's multiple ways to e.g. 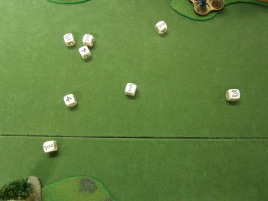 roll two or more successes on four dice. 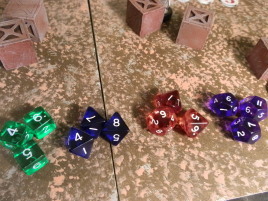 You might get more successes than required, and the successes may be on different dice. If you don't account for all the possibilities, your calculation is bound to be wrong. Calculating chances like this is possible using just classical probability math, but it is cumbersome as the number of combinations increases with more dice. Two or three dice is okay, but with four or more you're just brute forcing the solution for no good reason. I know, I've done it myself. The only really good thing about that is that you can do it with just pen and paper. The solution is still high school math, but admittedly somewhat advanced high school math. Quite frankly, I think this is above and beyond the level most game designers were paying attention to in school and sometimes you can see it in rules designs that behave oddly in some corner cases. The mathematical concepts involved are combinatorics and even further binomial distribution. I'm not going to regurgitate the basics here. You can find excellent reading behind the links above. Luckily, once you understand the problem excellent tools are available. There is no longer need to get a MatLab license or even to learn to use it. Even the humble Excel has BINOM.DIST function available. I wrote the following Excel sheet to help calculate the odds for multiple successes in a handy-dandy table format. All you need to do is figure out your odds for a single success and the table will automatically show all the odds for 1 to 20 dice. And if you really need the more, extending the table is not rocket science. The numbers shown are rounded for display purposes, but a dash is an exact zero -- you can't roll three successes on two dice. Just think of me fondly when using it. And remember, I didn't invent the laws of probability, I'm just telling you about them. You can disagree with me, but disagreeing with probability is like disagreeing with gravity. There's a reason they're not called the Opinions of Probability.